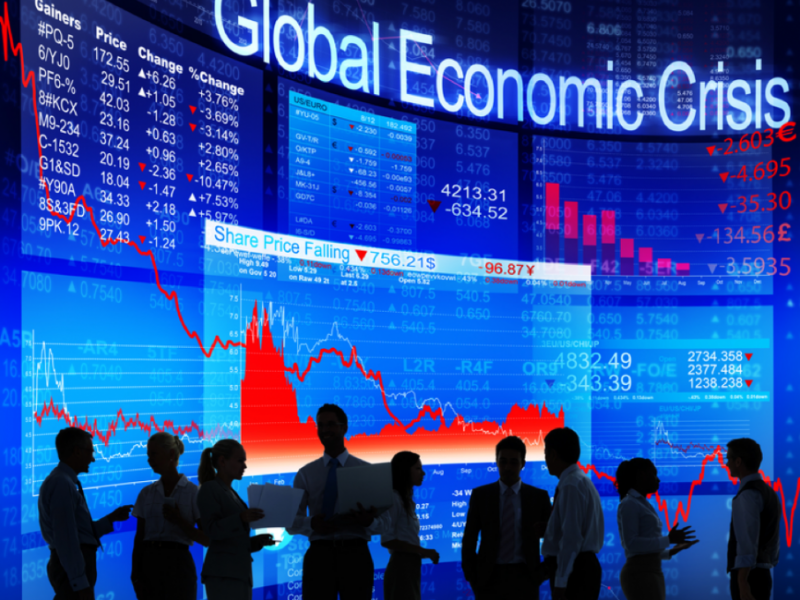 The current state of the global economy indicates that an imminent financial crisis, similar to the 2007-2008 worldwide recession, may not be far away. Knowing when a recession is on its way allows business owners and individuals to prepare and plan ahead. Economic shocks are most damaging when the economic growth rate has slowed down. The economic growth rate can be a leading indicator, which means that it slows down before other economic indicators. The leading economic growth rate has been on a downward trend in the past few months. As economic growth slows, consumption decreases, followed by sales and production. Eventually, businesses reduce their surplus workforce and unemployment rises. This combination of factors makes the economy more vulnerable to a recessionary crisis. China is both America's biggest trade partner and fiercest competitor. America's entrance into a trade war with China could hasten a potential recession and global financial crisis. This is because any increase in tariffs on American products for Chinese consumers could lead to a decrease in Chinese consumption and demand. In the same way, China is revamping their manufacturing and if the US imposes more strict tariffs on Chinese goods that would also cause problems. If a trade war isn't resolved quickly, then both the U.S. dollar and the Chinese yuan could become devalued. Weaker currencies lead to inflation. Over time, inflation paired with negative growth can engender an economic crisis. The CECL is the Current Expected Credit Loss model recently issued by the U.S. Financial Accounting Standards Board. Rather than waiting until the end of the quarter to calculate loss allowances, lenders will calculate them responsively, which should (in theory) better protect banks from evaporating assets. Some banks and financial institutions have raised concerns that the new model will negatively affect economic stability because it magnifies initial losses and accentuates cyclical fluctuations. In other words, if an economic crisis is in the making, the CECL model could amplify it. While declining home prices mean that more consumers are able to purchase homes, it can also be an indicator of reduced demand or consumers' reduced purchasing power. In this case, it could be the harbinger of recessionary trends. It's important to note that the catalyst for the 2007-2008 financial crisis was the collapse of the housing market in the U.S.
Analyzing these risk factors can help determine whether a global financial crisis is on the horizon. Governments and financial institutions can take precautionary measures to stave off a potential recession. Meanwhile, consumers can increase their savings.